Perhaps this is no coincidence because it’s my wife’s home city. I’ve been there many times over the years and got to know it quite well. Although Kobe suffered a devastating earthquake in 1995 which killed over 6,400 people, the damaged areas of the city have been completely rebuilt. Few signs of the quake remain. Foreign visitors to Japan mostly seem to take a well-trodden path, which doesn’t usually bring them to Kobe – the typical “see as much of Japan as you can in a week” tourist itinerary includes a few days in Tokyo, a stop at Mount Fuji, a bullet-train to Kyoto to see the temples, then back to Narita for the flight home. If you do find yourself in Japan, and you’re not on one of these guided tours, I recommend that you try to visit Kobe – you’ll find it very rewarding, but you’ll need to set aside 3 or 4 days in order to see all the sights mentioned in this blog. For a start the city has a wonderfully attractive natural setting, sandwiched between Osaka Bay and the Rokko Mountains. From Mount Rokko, which is easily reachable by cable car, a panoramic view of the whole Hanshin region (Kobe and Osaka) can be had. By day the view is impressive. By night it’s simply stunning. Kobe’s location and climate makes it a very pleasant city in which to live. People who work in the neighbouring and much bigger city of Osaka (20 minutes away by train) often prefer to live in Kobe, although it’s pretty expensive. So many celebrities now live in the Ashiya area of the city that it’s known as the Beverly Hills of Japan. Kobe has a vibrant food culture. This is after all the home of world-famous Kobe Beef. This isn’t just beef that comes from Kobe – it’s beef that comes from a particular breed of cow (Tajima-ushi). The cows are raised in a specific place, in a particular way, and the meat is graded according to some very strict rules. It’s illegal to export Kobe Beef, so the only way to taste the real thing is to come to Japan and try it. It’s a city with rather a sweet tooth as well. The cakes at Morozoff are sublime as are the handmade chocolates at Goncharoff and the Kobe Fugetsudo gaufres. Tins of Kobe gaufres make great souvenirs. The city also has some great shopping. The quality and variety of both the shopping and restaurants in Kobe, particularly in the downtown Sannomiya area, is every bit as good as you’ll find in Tokyo or Osaka. 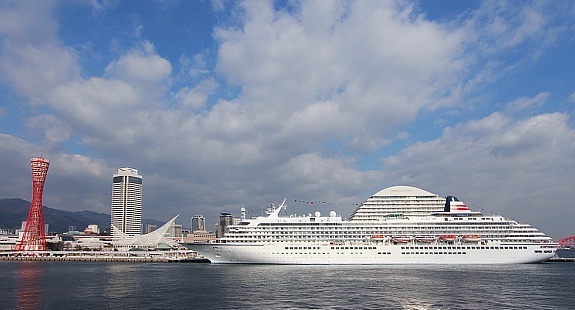 Kobe has been an important port city for centuries and was one of the first places in Japan to be opened up for foreign trade in the 19th century. As such it has always had a relatively large community of non-Japanese residents, particularly Chinese, Indians and Europeans. 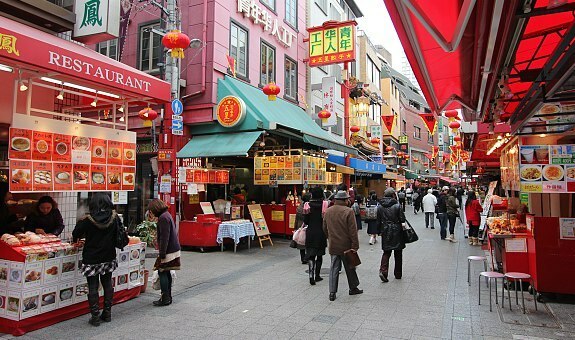 Today the city has a vibrant Chinatown (Nankinmachi area), a sizeable Indian community and a surprising number of long-term western residents. At the foot of the Rokko mountains is Kitano-cho (北野町, Kitanochō) an area where diplomats and wealthy foreign merchants settled in the second half of the 19th century. This area features a number of grand mansions, known as Ijinkan, more than a dozen of which are open to the public as museums. This is a lovely area to walk around as its steep, narrow streets have a nice variety of cafes, restaurants and boutiques. Kobe has long been famous for its sake – the Nada district of the city is the world’s top sake-producing region. The Hakutsuru Sake Brewery has a brewery museum in its grounds where you can see the whole process of sake brewing and there is usually an opportunity to do some sake-tasting. Kobe certainly makes the most of its location by the sea – Kobe Harborland is a lively waterfront shopping and entertainment district and Meriken Park is a waterfront park full of modern art and home to some of the best examples of the city’s iconic contemporary architecture, including the bright red Kobe Port Tower and the Kobe Maritime Museum. The city also has some attractive gardens and shrines. The Sorakuen (which has a Japanese garden and a Western-style garden) and Ikuta Jinja (a shrine) in Sannomiya are well worth a visit. Other places not to be missed around Kobe include Arima Onsen, a famous hot spring resort town on the other side of the Rokko Mountains, and the Akashi Kaikyo Bridge, which, at almost 4 kilometres, is the world’s longest suspension bridge. It spans the Akashi Strait and connects Japan’s main island of Honshu with Shikoku. The city also has its own airport. Kobe Airport opened in 2006 and is built on an artificial island only 8 kilometres from the city centre. The Port Liner (monorail) will take you from Sannomiya to the airport in just 18 minutes. Once you’ve seen all the sights of Kobe and sampled some of the great food you can either jet off from Kobe Airport or take a bullet-train from Shin-Kobe Station and continue your travels around Japan.